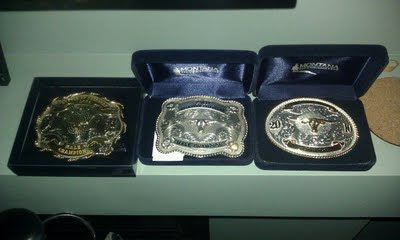 Marty won his 3rd belt buckle at the Battle at Buckhorn Triathlon this past Saturday. Tassie and I cheered him on to victory as he went wire to wire for the win. Tassie got LOTS of love from many people out there, and even went for a little swim in the lake after the race. The swim clinic went well that afternoon. It's amazing how fast 3.5 hrs can go. I was pretty wiped out after that and hit the bed early. We had another big morning on Sunday. Our first open water swim went off without a hitch. We had over 100 swimmers and the water was cool enough to wear a wetsuit if you wanted. I was glad for my sleeveless because I could definitely feel myself getting warm towards the end - I'm sure people in the full sleeves were roasting. Many opted not to wear one which was a good choice. I swam pretty good and ended up with a pilsner glass for my efforts. Don't forget about the Old School Aquathon - our first race is a week from Wednesday! The price went up today (but only by $5) so it's still only $25. Guaranteed to be a good time and great workout with great prizes! You can still sign up for the season pass if you'd like to do all 3 at a discount. And finally, this story was too funny and I think this golden doodle may be Tassie's cousin. This dog was out in his front yard when a half marathon ran by at mile 5 so he jumped his electric fence (definitely not good advertising for that company) and proceeded to run the last 8 miles! Here's a cute video of him finishing.